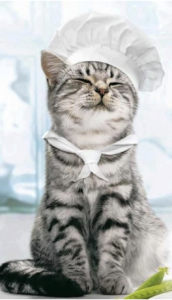 Holistic Health Services for Cats| Purrrfectly Holistic...a Boutique for Cats! Purrrfectly Holistic…a Boutique for Cats! Scroll down to read about each one. Should you choose to purchase the service you will be redirected via the link to our online store. As a pet parent how many times have you wanted to know what our furry friends are thinking or feeling? I can tell you that animal communication is a very real thing, and everyone has this ability, they just don’t know it. Essentially it is using a telepathic ability that we all have; we just have to be taught how to tap in to it. There are many benefits to animal communication: deepening your relationship with your animal, understanding or resolving behavior or health issues, learning what makes your animal happy, having a connection with them while you are away, and connecting after they have passed on or are about to pass. Whatever your reason may be, I can assure you it can be life-changing. Reiki, because it is holistic in nature, can address both physical and emotional issues, supporting healing on all levels. It is an ideal therapy to use with animals because it is gentle, painless, stress-free, and does not require direct physical contact in order to be effective; it also allows animals to choose their own level of participation and acceptance of the energy. A valuable time to offer Reiki to animals is immediately post-surgery, or post-treatment before they go home. By offering Reiki at this time, veterinary technicians can support a quick recovery. 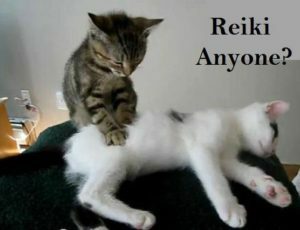 Another valuable time to offer Reiki is when an animal is sick or injured in order to assist in the healing process. Energy is not limited by time or space! Distance sessions are as effective as in-person sessions, and are often preferable to in-person treatments if an animal is excitable, anxious around strangers, very ill or ready to transition. Distance treatments can benefit in the case of an emergency as they can be easier to schedule. It is important that you have an open mind about the Reiki as it will allow your animal companion to relax and be open to accepting and communicating more freely. You may be present with the animal; however, it is important that you remain quiet and calm. And so began her journey and desire to help bridge the gap between humans and animals. She has an amazing gift to clearly communicate with animals that are still here on this earth and those who have crossed over. Lori has the unique ability to call in the angels for help in communicating with your animal friend in a way that can resolve issues for you or to come to an understanding of why your pet does what they’re doing. Her passion is helping clients and their pets find answers to their questions and provide guidance and comfort in difficult situations. With endless compassion she puts her heart into every Animal Communication and Reiki session in order to improve physical, emotional, and spiritual well being and healing. Lori is a certified animal intuitive. She has completed certifications as a Reiki/master teacher, Color and Sound Healing Practitioner, Archangelic Light master/practitioner, metaphysician practitioner, and is certified as a Spiritual Healer. Additional certifications include mediumship as well as in-depth and Advanced Channeling at the Arthur Ford International Academy. Residing in Selma, NC, she shares her life with her husband, 12 year old son, six cats and one dog. She has rescued and fostered cats and dogs for 45 years. In her free time if she’s not taking courses and continuing her certifications, she enjoys making homemade cards and all types of crafts. Lori, you have wonderful energy and a beautiful spirit and I am grateful to you for speaking to my precious boy. OMG, Lori, I have goosebumps! I am working 3 jobs, trying to start my own business, have chronic anxiety, adrenal fatigue and insomnia but never would I have guessed that Nemo was trying to tell me to chill out! Guess what my husband feeds our dogs every morning??? Yep cheese and lunch meat!!! He is always trying to eat anything anyone else has so I believe that he is bored. Lastly, we rescued a kitten this fall from the woods and nursed him back to health. He and Nemo seemed to really enjoy each other but my son took the kitten with him to college. Can you believe it? You are amazing!!! Lori, the information resonated with me are things I’ve been aware/thinking about, and it’s very good to get confirmation on these things. I hope it’s been positive for you to know how much was right on target and know that you definitely have a gift! KiKi did not return and I am sure he is in spirit at this point. Your message from him was true and it did help me accept what I knew to be true. Awesome job. You totally nailed it. ZoZo is exactly as you and the angels/guides described. He is so happy go lucky and devoted. He is gentle and kind and now that you point it out to me, I agree there is mounting frustration. Your final paragraph about why he is with me and his role in my spiritual path could not ring more true. That message also came to me last week in my meditation. So to get this message twice is truly moving and has taken my attention. Thank you for taking the time to help us. It helps both ZoZo and me and I know what to do now. Where do I start? I have tears streaming down my face. Thank you so much for speaking with him. He is right…I have felt so much guilt over his death and that I failed to protect him. He always loved to sit on my chest at night while I scratched his head, and he always gave me head butts when he wanted attention. He did love to sit next to me or on me and was very affectionate. It’s such a relief to know he is still here and sleeps with me and licks my hand. That is so comforting! I’m glad he understands I did everything I could to save him. This is a huge relief! Thank you! Interested in scheduling a session for Animal Communication or Reiki? Once your session is purchased you’ll receive a confirmation and Lori will contact you by email. You’ll need to email her your animal companion’s name and a photo. She will schedule a time for the session and asks that you be with your companion at that time. Once the session is over she will email you within 72 hours and share with you any of the symptoms or messages your animal companion has shared as well as general feedback and information about the session. Once your session is purchased you’ll receive a confirmation and Lori will contact you by email. You’ll need to email her your animal companion’s name and a photo, along with up to 3 questions or things you are seeking information about. Once the session is over she will email you within 72 hours and share with you details of the conversation, any messages your animal companion has shared as well as general information about the session. Here’s a great interview that Dr. Karen Becker, DVM, did on the subject of Animal Communication. If the possibility of speaking to your pet makes you even the slightest bit curious I urge to watch it! Muscle testing is the only way to know for sure if what you’re feeding or offering your cat is truly beneficial, if your’s body needs it, and if it’s in your cat’s highest and best good to use it. This can include food products, supplements, and any kind of medication whether it be something “natural” or “pharmaceutical.” You can read more about how muscle testing works on our Holistic Health and Muscle Testing page. Pam Roussell has developed a very strong intuitive ability and performs this analysis service herself. If your cat has a health issue or perhaps you want to find out if the products you’re using are beneficial, let’s muscle test and find out! The technique works both in person and remotely with a photo of your cat. How? Energy is energy and cannot be contained. Therefore, the energy resonating in person or remotely is the same. When you purchase an analysis with Pam you’ll provide her via email a photo of your cat along with photos or a complete, detailed list (including brand names) of food, supplements, medications, flea/pest control, grooming products, and anything else pertaining to your cat’s lifestyle or health you would like analyzed. Please allow up to 3 days for her to complete the analysis. Want to see an example of what this looks like? Check out Tanisha’s Story and Liz Taylor’s Troubles. You can also ask Pam questions and discuss your concerns before you purchase. Click here for a FREE 20 minute consultation. 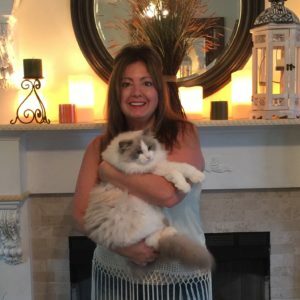 If you reside in the Houston, Texas area Pam can meet with you and your cat in the privacy of your own home to resolve health or behavioral issues. Sometimes this is the best way to understand and observe behavior, find solutions to conflicts, muscle test remedies, provide ECR, and more. The fee is $75/hour and will be prorated by 15 minute increments. For appointments 10 miles or more away from the home office there will be a $25 travel fee. Payments are due when services are rendered and can be made by cash, check or PayPal. Contact Pam by email at pam@purrrfectlyholistic.com or by phone at 713.562.6888 to book an appointment.